Building in seating into bricks or concrete means a seat that never gets old, breaks, or needs replacing. Build up the area around your pizza oven with tall garden beds with inbuilt seating on the edging. 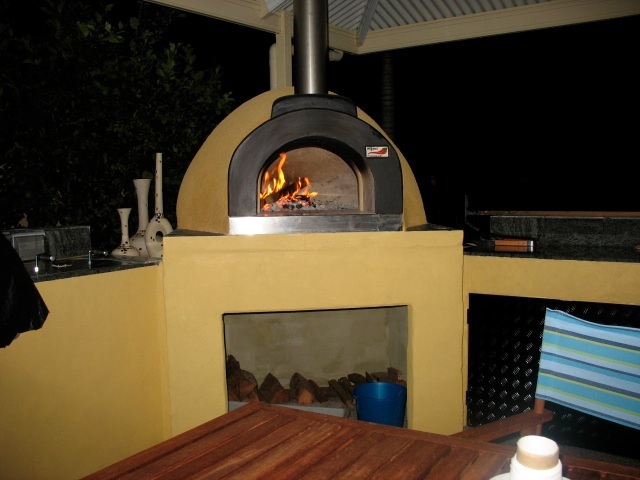 This can make your pizza oven area really stand out and be like a little dining room in your backyard. Around the edges of your eating area is a great place to put in solar lighting. These lights charge up during the day so they can shine brightly at night. Use tall stake lights and then accessories with fairy lights around the perimeter for that extra added touch. If inbuilt seating isn’t really an option in your backyard, the next best thing is a brand new matching outdoor dining set. Make sure that you get comfy seats to encourage as much use as possible. A large reinforced glass table is a popular choice for an outdoor dining table. Shopping at a specialty outdoor furniture store will yield better results than a store that sells a wide range of goods. Not that formal? Exterior bean bags may be more your go then. They come in a range of different shapes and sizes so there’s something to suit all tastes and areas. Then comfy, cozy bean bags are hard wearing and are perfect to sink into with a delicious slice of pizza. You can pair your outdoor bean bags with a low outdoor table similar to a coffee table, or simply fashion your own rustic look with pallets or crates and planks of wood. What could be cooler with your outdoor bean bags than watching a movie in them? All you need to set up your very out outdoor cinema is a painted white wall and a projector. While many projectors are quite on the pricey side, you can find some bargains or go second hand. Make sure to always pack up your equipment after the movie is over so that you don’t end up ruining your projector. A great way to keep the mood going after dinner fresh out of your Alfresco wood fired pizza oven.